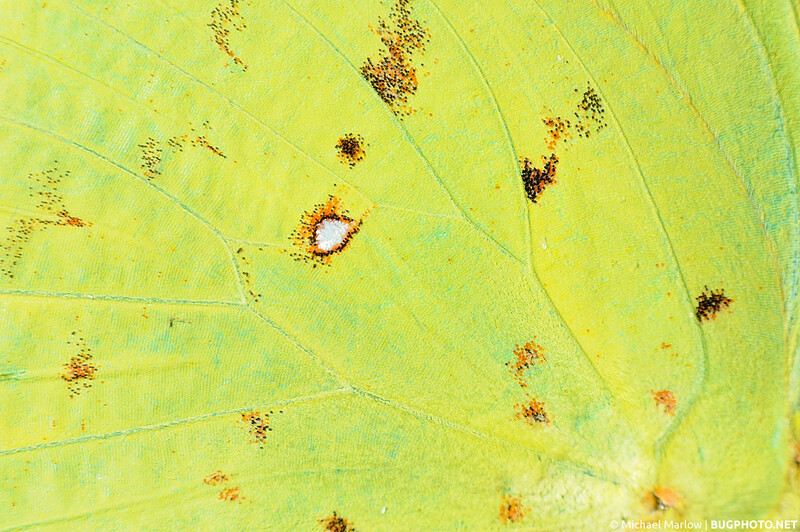 This is the first in a series of posts about the BugPhoto approach to macro photography. The realm of macro photography, the type featured here on BugPhoto.net, is one of tiny subjects and hidden landscapes. This post will be the first in a series in which I hope to share some of the techniques and tips I have learned while staying within relatively modest means. True macro photography results in shots like this uncropped view of a sulphur butterfly’s wing. The high magnification shows the tiny, intricately-layered scales that give the Lepidoptera their name. Photographed with a Nikon D5000 DSLR and reversed 18-55mm f/3.5-5.6 kit lens. Before I get into specific topics about macro photography (or macrophotography), I think it is important to make a distinction. Macro photography can have different working definitions for different people, even if it technically refers to something specific. For my purposes here, and in line with the technical definition, “macro” refers to image reproduction at a 1:1 magnification ratio or greater. Essentially this ratio means if you perfectly lined up a camera’s hypothetical 1 square inch sensor with a 1 square inch ceramic tile, the tile would perfectly fill the image edge to edge; at greater ratios you’d be unable to fit the whole subject into the frame as it would be magnified above life-size. This life-size or larger capturing is largely my obsession, but a lot of people do not need or desire to get this kind of magnification. What they and maybe you are looking for, is close-up photography, which is pretty much a common-sense term, not a technical one. You take a photograph of a close-up view of your subject. It might be something smaller or you might be “zooming in” on a smaller area, but it’s not so small that you need or want it to fill up the camera’s sensor. This dragonfly shot, an example of “close-up” photography, was the one that got me excited about insect photography, and the idea that maybe I could be good at this. Photographed with a Canon Powershot A620 point and shoot camera in “Macro” mode. If you’re going for close-up as opposed to macro, the “macro” feature1 on a point and shoot camera (that “little flower” setting on your camera!) will usually allow you to focus close enough to your subject. The little flower also appears on DSLRs, but if you don’t have a macro lens, it isn’t going to help you get any closer focus than your other settings, which aren’t going to get you any closer focus than your chosen lens. That’s okay, because you can figure out what the minimum focusing distance, i.e. how close you can get before the lens won’t focus, similar to how your eye is unable to focus when you get really close to something. You can get pretty close to take pictures of things like flowers or large butterflies, and with the ever-increasing megapixels of digital cameras of all kinds, you can crop your way into even closer views. For many, that’s going to suffice, and there’s an infinite number of great photos waiting down that road. Now if you want to see the hairs on a spider’s head or the individual lenses of a fly’s compound eye with clarity, you’ve come to the fork in the road and it’s time to follow the sign towards “macro.” As this show gets on the road, I will try to show you how I create my images, touching on topics from equipment and accessories, techniques, a DIY solution or two, software and other computer issues, and any other odds and ends I can think of. In my next post, I’ll introduce and discuss my rig and break it down from there. In the meanwhile happy shooting macro or otherwise, and be kind to your bugs! 1. They call it a “macro” feature more often than not, but it does not usually — maybe not ever, but there’s a lot of cameras I can’t speak for, naturally — but so, this feature, it does not usually make the camera capable of a 1:1 reproduction ratio. So you can see why there is confusion about macro vs. close-up photography. 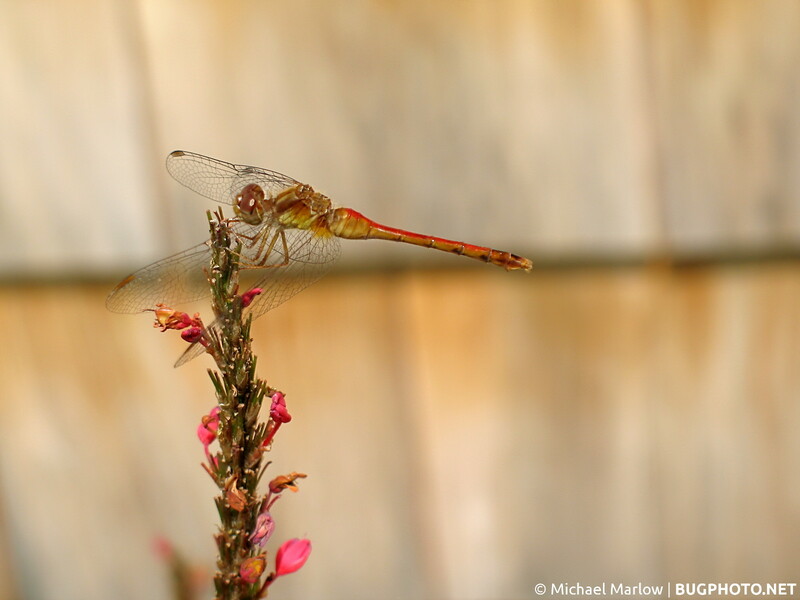 Posted in Butterflies, DragonfliesTagged BugPhoto Guide, butterfly dust, Close-up Photography, dragonfly, Macro Photography, meadowhawk, scales, sulphur butterfly, yellowBookmark the permalink. Yes, looking forward to these as well!